Out of Australia via Atlanta, Iggy Azalea is one of the hottest new female rap stars in the game. Having spent 2012 turning heads and garnering the respect of industry and hip hop heavyweights Iggy has signed a deal with Mercury Records here in the UK. Iggy Azalea’s original classic mixtape ‘Ignorant Art’, catapulted her into the limelight in 2011, shortly followed by the six-track ‘Glory EP’ which featured a track with Mike Posner, BOB and Pusha T. May last year brought Steve Aoki’s hit ‘Beat Down’ that Iggy featured on making way for her third mixtape ‘Trap Gold’ which dropped at the tail end of 2012. The Trap Gold mixtape highlights Iggy’s double-time flows, trap beats and production courtesy of Diplo and FKi. 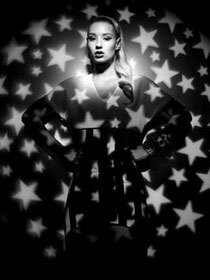 April 8 sees Iggy’s first official UK release, ‘Work’ showcasing a snippet of her debut album ‘The New Classic’, produced by The Invisible Men and 1stdown of FKi, due for release Spring 2013. The track is laced with brooding beats and struts the line “no money, no family, 16 in the middle of Miami”. In March Iggy will be hitting the road with rap star, Nas on the European leg of his tour.